Our fees are all inclusive so no additional costs. We accept all childcare vouchers and offer 2-4 year old funding. Our spaces fill fast so we advise enquiring as early as possible to ensure you get the sessions and start date you require. *Terms & conditions apply. Contact us for more information on our fantastic discounts. Our preferred method of payment is via direct debit or paying online. 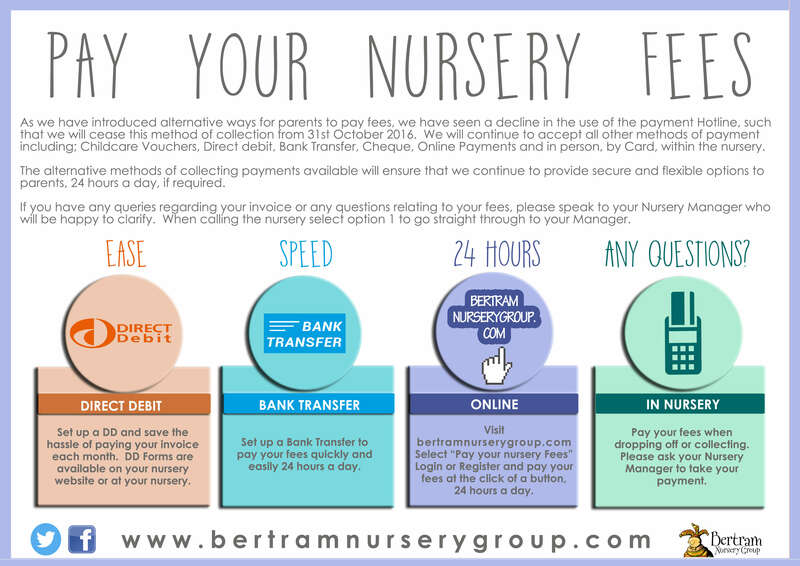 Holyrood Nurseries' parent company, The Bertram Nursery Group accept payment for fees for any of its nurseries online. Other acceptable methods are childcare vouchers, cheque, credit card or standing order. Unfortunately we do not accept cash. We are pleased to offer England’s new 30 hour funded childcare entitlement for 3-5 year olds at Holyrood Nursery Media City, and will continue to offer the 15 hour council funded childcare scheme where preferred. Acceptance of funded places within our nursery is dependent on our availability. Bookings made under the 30 hour funded contract are subject to supplementary charges, as per Department of Education Guidelines. These charges are designed to cover costs associated with hot lunches, healthy snacks and extracurricular activities over and above the basic funded provision. Following consultation with our current families, we have decided to ‘stretch’ the 30 hour funding entitlement from term-time only cover to year-round cover full. This equates to 22 hours of funded childcare per week which can be assigned to varied session patterns. If you desire a term-time only place, you may wish to consider 15 hour funding as an alternative. Please contact us to discuss further. Many families do not take advantage of the financial help that is available to them for the cost of childcare. Families on middle as well as low incomes may be entitled to financial support such as Child Tax Credit or Working Tax Credit. This extra help, called ‘the childcare element of working tax credits’, is available to individuals on lower incomes to help with the cost of childcare. The amount received is dependent on your circumstances and income, but could cover up to 70% of your childcare costs. Find out if you are eligible for assistance here or call the Tax Credit helpline on 0845 300 3900. Child Care Vouchers allow you to pay nursery fees tax free from your salary. This is a salary sacrifice system of up to £55 per week per parent. The money comes directly off your salary before deductions, giving you savings on tax and National Insurance contributions. You will receive a voucher or e-voucher that is given to the nursery and is deducted from your bill. A number of childcare voucher providers offer this service to companies, please ask your employer if this is a benefit they offer. We are registered with a number of voucher providers and are happy to sign with other agencies as used by your employer. If you receive tax credits, the amount you are eligible for may be affected by using childcare vouchers. You can check whether you would be better off taking childcare vouchers through the free online calculator. If you're a working parent, you can open an online account to pay for childcare. The government will top-up the money you pay into the account. For every £8 you pay in, the government will add an extra £2. You can receive up to £2,000 per child per year. You, and any partner, must each expect to earn (on average) at least £120 per week (equal to 16 hours at the National Minimum or Living Wage). If you, or your partner, are on maternity, paternity or adoption leave, or you're unable to work because you are disabled or have caring responsibilities, you could still be eligible. If either you, or your partner, expect to earn £100,000 or more, you can’t get Tax-Free Childcare. You can’t use Tax-Free Childcare at the same time as childcare vouchers, Universal Credit or tax credits. You can use it with the 15 hours and 30 hours schemes.